Guinea is a poor country that possesses major mineral, hydropower, and agricultural resources. The country has almost half of the world's bauxite reserves and significant iron ore, gold, and diamond reserves. However, Guinea has been unable to profit from this potential, as rampant corruption, dilapidated infrastructure, and political uncertainty have drained investor confidence. In the time since a 2008 coup following the death of long-term President Lansana Conte, international donors, including the G-8, the IMF, and the World Bank, have significantly curtailed their development programs. Throughout 2009, policies of the ruling military junta severely weakened the economy. The junta leaders spent and printed money at an accelerating rate, driving inflation and debt to perilously high levels. In early 2010, the junta collapsed and was replaced by a Transition Government, which ceded power in December 2010 to the country's first-ever democratically elected president, Alpha Conde. 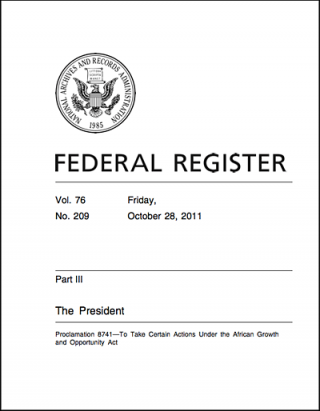 Presidential Proclamation 8741 of October 25, 2011, reinstating AGOA preferences for Niger, Guinea and Ivory Coast.